The foundations for what would become Jim Elliot Christian School were laid when three groups of people began to pray independently for God’s provision in developing a new Christian secondary school in the Denver area. 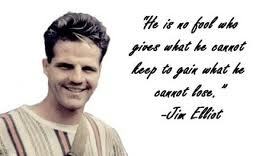 The school was named after Jim Elliot, a missionary to Ecuador who, along with four other young husbands and fathers, was killed in 1956 while attempting to make contact with a previously unknown people group called the Waodoni. This made a statement of direction as a community passionately committed to Christ, and an identification with those who seek to live incarnational lives wherever God has placed them. Jim Elliot School officially opened in September of 1991 as a middle school/high school with twenty-three students representing twenty families. The school also affiliated with the educational institution Association of Christian Schools International (ACSI). In 2004 our Board approved a name change to Jim Elliot Christian School to better reflect our spiritual emphasis to the community. Jim Elliot Christian School’s formational education is designed with a strong focus on both academics and Christian formation. We have a desire for each student to be in mission with God. We equip our students to achieve this goal by emphasizing above all a focus on God and His work in the world. Jim Elliot is committed to growth through the development of wisdom and the knowledge of truth by means of a formation-based education. We seek truth wherever it is to be found while subjecting all claims to Jesus Christ and His Word. We seek to join God in mission wherever He is at work, looking at the world through the eyes of Christ to see where He is calling us as disciples to be a part of the redemptive work of the Gospel. It is not enough to be just a Christian School. Youth of today are pulling away from the faith in greater numbers than ever before. Here at Jim Elliot, God has established a secure place for kids to learn academically and to discover who they are in Christ with confidence and authenticity. This security and assurance does not come from isolating them from the world, but by providing the tools for them to navigate their culture.